Isla Palma is a very small private island some miles southwest of Cartagena in the archipelago San Bernardo in the western Caribbean. It is only about one mile long and 400 yards wide and can only be reached by boat. 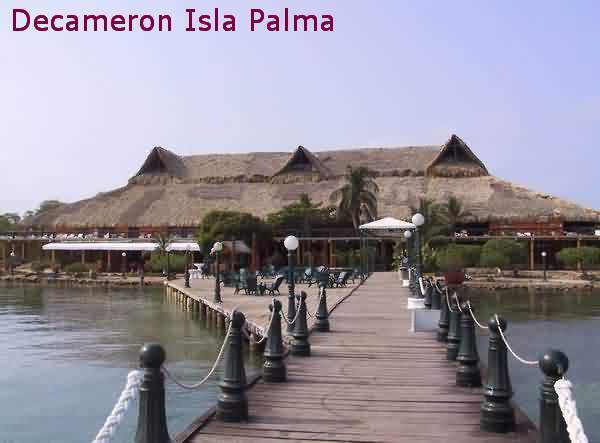 There is a comfortable hotel with 42 rooms, the “Decameron Isla Palma”, build of wood in a very interesting architecture. It is surrounded by mangroves - a good ground for my HF9VX vertical. The antenna worked fine, even without radials (I had no chance to arrange the radials in the morass). The island is good for a sidetrip of 3 or 4 days. You can simply relax or do a lot of possible things like SCUBA diving, snorkeling, windsurfing, playing volleyball, walking around the island, do boat trips to other islands in the archipelago or playing radio (if you have one). To find more info about Isla Palma click here.